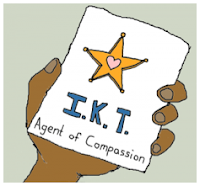 COMPASSIONATE CLIMATE ACTION: The Compassion Games Start Soon! Those of you who enjoy TED Talks will know that the TED Prize is the granting of a wish. A big wish! In 2008, Karen Armstrong, a religious scholar, won the TED Prize and her wish was to create a Charter for Compassion. [I]t is an arresting fact that right across the board, in every single one of the major world faiths, compassion — the ability to feel with the other ... — is not only the test of any true religiosity, it is also what will bring us into the presence of what Jews, Christians and Muslims call "God" or the "Divine." It is compassion, says the Buddha, which brings you to Nirvana. Why? Because in compassion, when we feel with the other, we dethrone ourselves from the center of our world and we put another person there. And once we get rid of ego, then we're ready to see the Divine. And, in particular, every single one of the major traditions has highlighted — has said, has put at the core of their tradition — what's become known as the Golden Rule. First propounded by Confucius five centuries before Christ, "Do not do unto others what you would not like them to do to you." That, he said, was the central thread that ran through all his teaching and that his disciples should put into practice all day and every day. And it was the Golden Rule would bring them to the transcendent value that he called rén, human-heartedness, which was a transcendent experience in itself. You can affirm the Charter yourself on the website, taking "the first step in a global movement that can change the world. By listening, understanding and treating others as we wish to be treated ourselves, we can reset compassion as the cornerstone of a just economy and a peaceful world." This blog has looked at compassionate climate action from many different perspectives and through many lenses. It has even worked hard (at times) to be compassionate towards those who seem hell-bent on destroying the biosphere, because, as Dr. Stan Goldberg explains in The Fear of Change, "most [of their rantings] are expressions of loss that are as significant to social conservatives as the losses are to the disabled or those coming to terms with the end of their life." So, today, as a compassion tune-up for myself and for any readers who want to have some compassionate fun, I'd like to tell you about the Compassion Games, a global "coopetition" where community members "compete with and not against each other to bring out their very best while striving to make their community more compassionate ... where genuine altruism becomes the norm." Their motto is "Survival of the Kindest" (which, in a sense, is ecologically correct). The Compassion Games run from September 11 to 21 each year (the start date having special meaning in the United States). They're "designed to help heal and inspire, making our community a safer, kinder, more just and better place to live." You can perform a Random Act of Kindness, or become a Secret Agent of Compassion and receive a secret mission for each of the eleven days. You can participate in Service Projects, report on your compassionate acts, and then celebrate with the rest of the online community. I think I'm going to encourage my students to get involved! With that, I would like to send out a prayer for peace and compassion in and towards the Middle East, especially Syria — with a heartfelt request that people not jump to accept any conclusions coming from those who stand to gain much from destabilizing yet another stable government in that fossil fuel-rich yet beleaguered part of the world.